Bradford Mela Finale Drum Circle - ahoy ship mates! We arrived at the Bradford Mela festival to deliver a big African Drumming Circle, and the day looked so good to start with. The sun was shining and it was so obviously going to be a scorcher - wasn't it? A couple of hours later the clouds came in and the rain came. 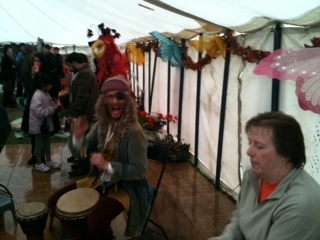 Thank goodness we had insisted in having the drumming in the marquee! As things got wetter the marquee got busier and as the marquee got busier the beats got funkier! The final session was absolutely amazing. We must have played with the participants non stop for an entire hour and the space was absolutely buzzing with African Songs and African beats! 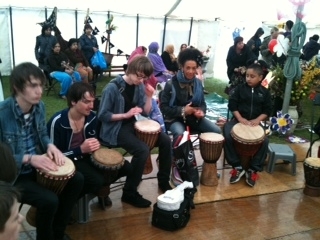 The wind and rain battered the marquee outside but inside we were warm and having unbeatable rhythm bliss! Many thanks to Q20 Theatre Company for booking Unbeatable Energy for the day.